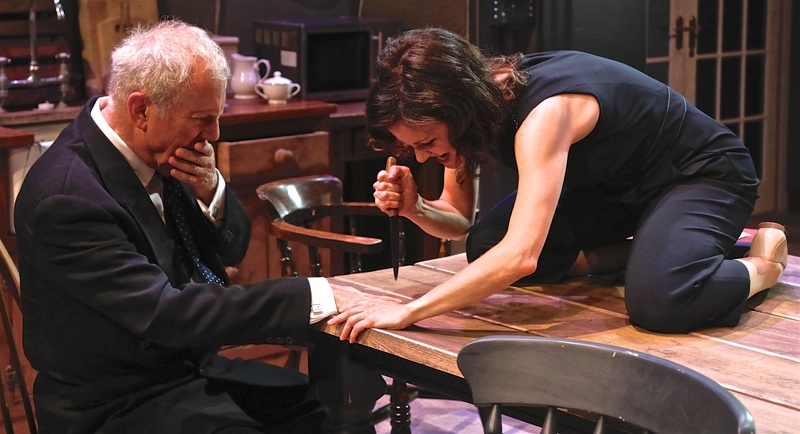 Benet Brandreth & Kosha Engler in Hamlet. Images Francis Loney. Shakespeare’s longest play, the four-hour Hamlet, is reduced to a kitchen sink drama in what can only be described as a vanity project by the Brandreth family which has just opened at London’s Park Theatre. In this summer of Hamlets – Tom Hiddleston doing Branagh’s at RADA, Andrew Scott bringing the Almeida’s to the West End – one has to admire entertainer, writer and former MP Gyles Brandreth, his barrister son, Benet, and daughter-in-law Kosha Engler, for their ambitions. But, at 90 minutes long, with major scenes removed (alas, poor Yorick is consigned to a micro-cameo at the end) the result is a bit of a mess. Benet, who, I’m sure, brings a theatrical flair to the Bar, plays the troubled Dane with one eye on the jury. He addresses the audience throughout as though he is making a closing speech, fixing one poor theatre-goer with a steely stare and bringing home the salient points with a thrust of his clenched fist or forefinger. His is a very intense and determined prince, less mad and more quietly plotting, using his razor sharp mind to bring the accused to justice and right a miscarriage of the most heinous kind. 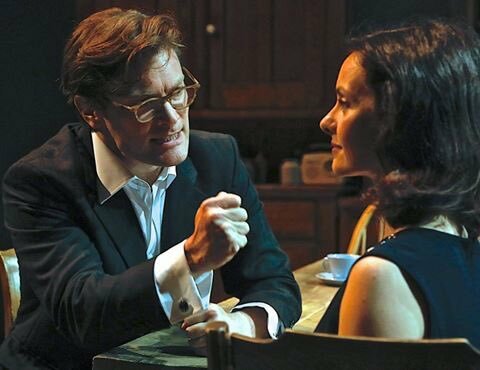 That leaves Gyles and Benet’s wife, American actress Kosha Engler, to play “the rest”. Actually, not all of the rest because quite a few characters never make it to the final cut of this truncated version. Rosencrantz is without her Guildenstern, the Player King is without his troupe and Fortinbras doesn’t get a mention. Polonius appears to have totally forgotten about his son, Laertes, until, in a ludicrous and far-fetched plot twist, he emerges to avenge his sister and father’s deaths, thus turning a tragedy into a black comedy. The play is very well spoken, as you’d expect from this trio of thespians – and Benet does a splendid impersonation of his father during the mummers’ performance – but it has been abridged so much that it rattles along without any care taken to give depth and emotion to the story. Where’s the tragedy? One second Engler is portraying Ophelia and, in the next breath, the schizophrenic girl, now channelling her brother, is told Ophelia is dead. “What? Where?” He/she splutters. Well, exactly. Engler, playing Gertrude, Horatio, Ophelia and Rosencrantz, does her best to give each role a different voice and character but she’s darting in and out, sometimes changing parts in mid flow. Gyles tries to cope with the Ghost of Hamlet’s father, Claudius, Polonius and the Player King. However, they do blur into one after a while. All too often, in Polly Sullivan’s very nice, very French provincial, kitchen set (surely socially unacceptable for royals to be slumming it at a kitchen table, isn’t it?) it takes a moment to realise that either Gyles or Kosha has swapped characters, by which time they’ve moved on to someone else. 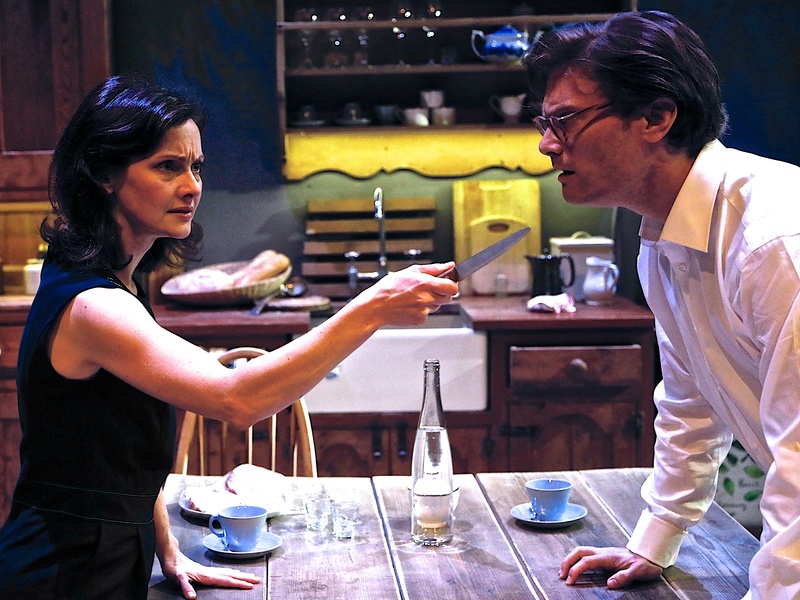 But I was impressed by the production’s pared-down version of the play’s sword-fighting scenes. The knife game – or five finger fillet (who knew?) – must have taken hours of practice, unless it is a Brandreth party trick. I would be amazed if one of the trio isn’t stabbed at some point during the show’s run. Yes, it’s a watchable Hamlet for perhaps a modern generation who can’t concentrate on a lengthy Shakespearean tragedy, but to what end? Do we congratulate directors Simon Evans and David Aula, and the company, for jettisoning great chunks of the work or berate them for needlessly hacking a great play to pieces? This is very much a case of less isn’t more. Hamlet runs in the Park90 until September 16. This pared-down Hamlet, by the Brandreth family, has been filleted to the bone with key scenes becoming darkly comic rather than tragic. 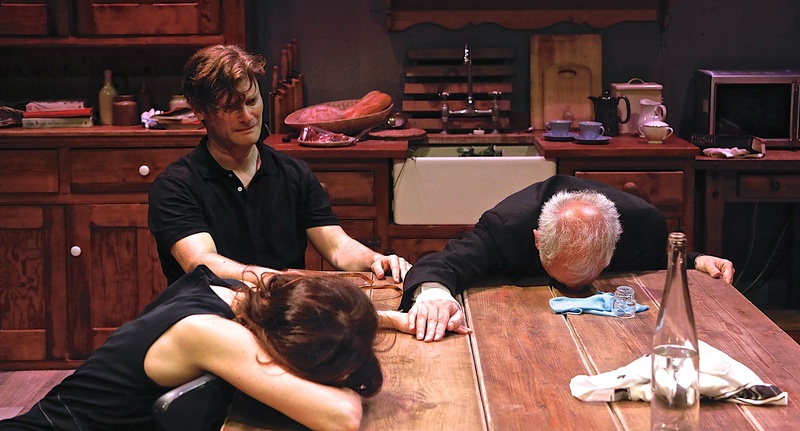 A kitchen sink drama with a twist too far.